My favorite farmer’s market, Lakeside Farmer’s Market, had baby red potatoes and fresh corn this weekend, and I knew I had a bag of shrimp in the freezer, so why not make a shrimp boil? Seafood boils, otherwise known as Frogmore Stew, have a long and storied history in the lowcountry of South Carolina. Some stories claim that a local fisherman originated the recipe as a way to use the bounty of the sea and the vegetables he’d just harvested. Another story places the development of the seafood boil with Richard Gay, the owner of a seafood restaurant on St. Helena Island, SC, who was tasked with feeding over 100 National Guardsmen. Frogmore Stew was just the ticket to feed lots of men with minimal effort, and serving it on tables covered with newspaper eliminated the need for a massive cleanup. To make my shrimp boil, which is only kinda legit since I omitted the kielbasa sausage, I started with a big pot of water. 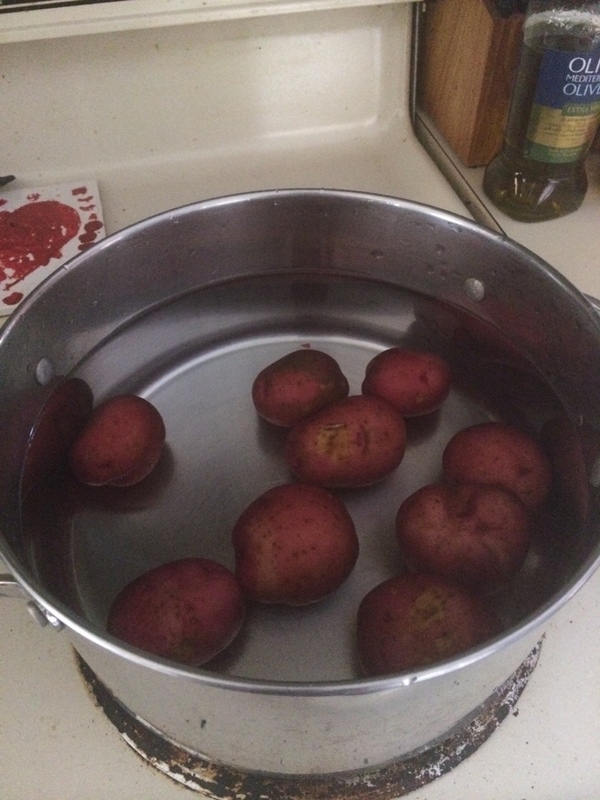 I washed and dumped in the baby red potatoes. 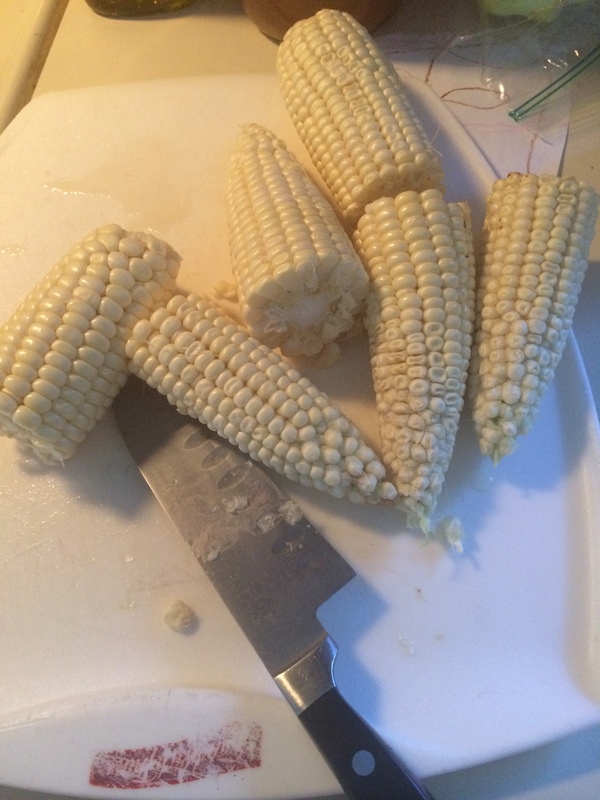 While the potatoes were boiling in the seasoning mixture, I shucked my corn, removed the silks and cut each ear in half. I dumped the corn into the pot and let that boil for about 10 minutes with the potatoes. If you’re using sausage, you’d add it with the corn. After letting that boil a while, I added the shrimp. They only need to boil in the pot for about 3 to 4 minutes, or until they turn pink. 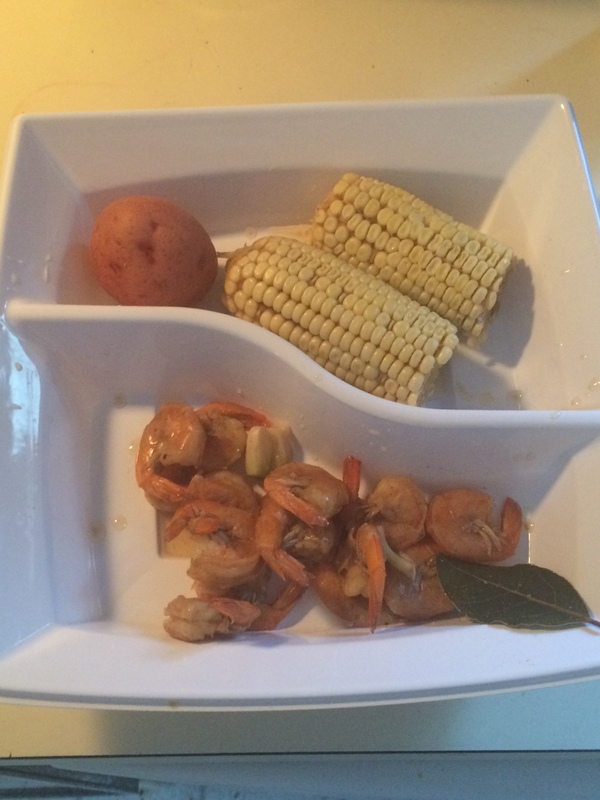 Then you’re ready to plate your shrimp boil, or to dump it out onto a newspaper-covered table! School’s out, and in our household that means it’s high time for some historical adventures. See my parents weren’t the type to just be content with going to the beach every year. Oh no – from the time I was born until I graduated high school, our family vacations typically involved visiting historical sites up and down the East Coast. In fact, my mother still has photo albums stuffed with pictures of me, my brother and sister standing in front of various obscure historical markers throughout Virginia, Maryland and Pennsylvania. Jul. 19 & 20, 2014 – Surry, Virginia Pork, Peanut & Pine Festival – This down-home celebration of the three P’s of coastal Virginia has a parade, plenty of delicious food, a kids’ corner, arts and crafts vendors and plenty of fun. $5 per person, 10 and under free. Chippokes Plantation State Park, 695 Chippokes Park Rd., Surry, VA 23883. Saturday, July 19 & Sunday, July 20, 10 AM- 5 PM. Jul. 19 & 20, 2014 – 1771 Market Fair at Claude Moore Colonial Farm – Sit in the shade and savor roast chicken and spicy sausages, enjoy dancing and singing with the fiddler, test your watercolor and writing skills with Mr. Andrews at the Stationer. Muster with the militia and re-outfit your home in furniture from the Cabinet Maker. Only at Market Fair can you catch up on the latest news from the frontier and trade stories while enjoying local ale and porter at the Tavern. Try hands-on crafts such as spinning and dyeing, and shop for goods from the finest merchants in the colonies. $7/adult, $3/child aged 3-12, $3/senior, under 3 free. Claude Moore Colonial Farm, 6310 Georgetown Pike, McLean, VA 22101. Saturday, July 19 & Sunday, July 20, 11 AM-4:30 PM. Jul. 25 & 26, 2014 – Summertime Barrels, Bottles & Casks at Thomas Jefferson’s Poplar Forest – Cool off on a hot summer evening and sample various beverages, brews and spirits served at Poplar Forest during Jefferson’s time. Special guided tours will highlight the meals and drinks that Jefferson and the plantation’s enslaved community consumed at Poplar Forest, followed by a cellar-side beverage tasting and light, seasonal snacks, including homemade ice cream. $25/person, must be 21 or older. Thomas Jefferson’s Poplar Forest, 1542 Bateman Bridge Rd., Forest, VA 24551. Friday, July 25 & Saturday, July 26, tours departing at 6 PM and 7 PM both days. Aug. 8 & 9, 2014 – 9th Annual Filipino Festival – Enjoy authentic cuisine such as lumpia, pancit, adobo, lechon, halo-halo and more with San Miguel beer or your favorite wine. Some vegetarian dishes will be available and entertainment will be provided by several local bands. The cultural program includes a fusion of dance, music, song, artwork and exhibits by local and regional Filipino talent. $2 suggested donation. Our Lady of Lourdes Catholic Church, 8200 Woodman Rd., Richmond, VA 23228. Friday, August 8, 5-10 PM; Saturday, August 9, 10 AM-10 PM. Aug. 9, 2014 – Edible Food Fest in Orange – A delicious celebration of the Earth-to-table movement and its unique roots in Central Virginia. Demos by some of the restaurant-rich region’s leading chefs and expert talks on a variety of topics. Vendors include Blue Ridge Pizza, Plantation Peanuts of Wakefield, Hudson Henry Baking Co., Croftburn Market, Rebecca’s Natural Food, Virginia Vinegar Works and more. $7/person, 12 and under free. Downtown Orange, VA 22960. Saturday, August 9, 10 AM-6 PM. Aug. 20, 2014 – Family Day at Wilton House Museum – Bring the family by for a tour of the historic house, geared for elementary and middle school aged children, followed by a lesson in colonial cooking. $10/person. Wilton House Museum, 215 S. Wilton Rd., Richmond, VA 23226. Wednesday, August 20, 1-2:30 PM. July 12, 2014 – Canning With a Jefferson Spin – Culinary historian Leni Sorensen will tantalize with stories of the cooks in Jefferson’s kitchen, who canned and preserved food for the Monticello household. Using a historical recipe from Mary Randolph’s The Virginia House-wife (1824) and green tomatoes from the Monticello garden, Leni will guide the class in creating a thick and spicy tomato marmalade of their own. $28/person. Saturday, July 12, 9:30 AM-12:00 PM. July 26, 2014 – Mary Randolph Culinary Workshop – Curry chicken and rice was an international dish popular at elite 19th-century dining tables. Culinary historian Leni Sorensen will demonstrate how to make Mary Randolph’s curry powder just as her cooks did in her 1824 Richmond kitchen. The class will then prepare and enjoy the curry dish and fresh Monticello vegetables. $28/person. Saturday, July 26, 9:30 AM-12:00 PM. August 7, 2014 – Let’s Go Cook – Join Monticello’s Eleanor Gould for a fun, hands-on, family-friendly cooking class. Young cooks and their favorite grownups will begin by harvesting fruits and vegetables from the Monticello gardens. The class will then help prepare both sweet and savory recipes that were favorites of the Jefferson family. The reward will be to eat what’s been made and take home the recipes. $18/adult, $8/child, under 5 free. Thursday, August 7, 9:30-11:30 AM.